ROCKHAMPTON'S modern art collection is recognised as "nationally significant" but much of it remains in storage, having outgrown the original gallery space. 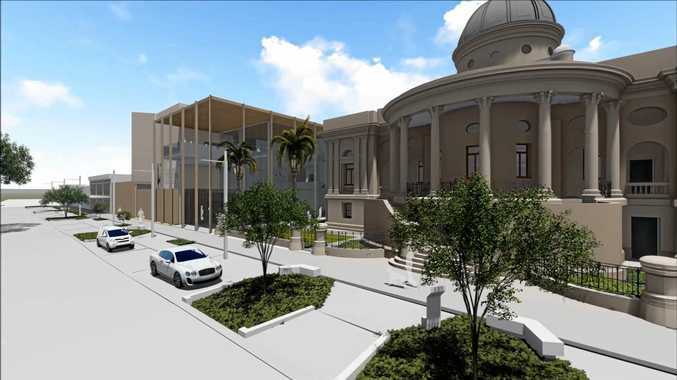 In a bid to give the premier collection established by former mayor Rex Pilbeam a worthy home, Rockhampton Regional Council this morning endorsed plans for the relocation of the gallery to a new $31.5 million cultural precinct. Nestled on the redeveloped Quay St riverbank, stunning schematic designs reveal a striking modern building sitting alongside heritage-listed Customs House. An artist's impression walk-through of the space show an open and airy space capable of hosting anything touring the nation's capital galleries. 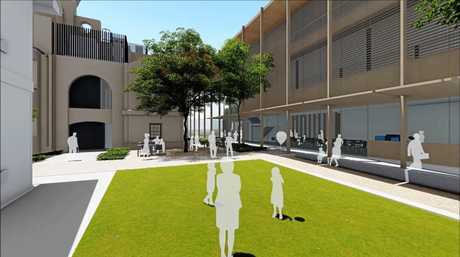 Initially, the new Quay St building was estimated to cost $16 million. However, mayor Margaret Strelow told councillors gathered for today's general meeting this budget was not enough to deliver a gallery capable of significantly expanding Rockhampton's art offering. 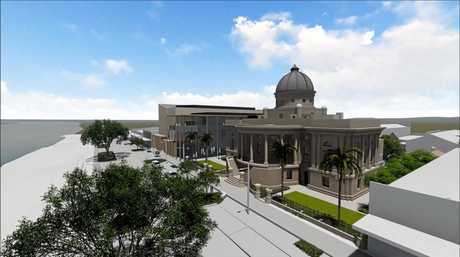 Cr Strelow said for the size of the gallery, the increased budget of $31.5 million for a new building was still modest. "The original estimate of $17 million was based on the 2016 feasibility assessment of Customs House and 212 Quay Street and what it could cost to repurpose these two buildings as an art gallery," she said. "After speaking with leaders in the industry, including a meeting between Councillors and the Director of the State Gallery, we took on board the advice about minimum size for spaces for visiting exhibitions and then undertook a further assessment of what size upstairs gallery we really needed to accommodate our permanent collection, we realised that this was the moment to build for the future. "The original plan was less than two thirds the size of the one adopted. "The square meterage cost of the new gallery is on par with current cultural facility construction costs like that of the Waltzing Matilda centre in Winton, for example." The three storey structure will have 4700 sq m gross floor area, including several double volume exhibition spaces, retail and cafe sections, multipurpose areas and administration and storage spaces. The increased budget also means the project will now rely on whether council is able to secure significant State and Federal Government funding. Cr Strelow hoped the additional $20 million needed could be secured in a 50:50 split between the two levels. "Clearly, without their support this doesn't happen," she said. In 2017, council received a $2 million grant from the State Government to progress the Business Case and design works. 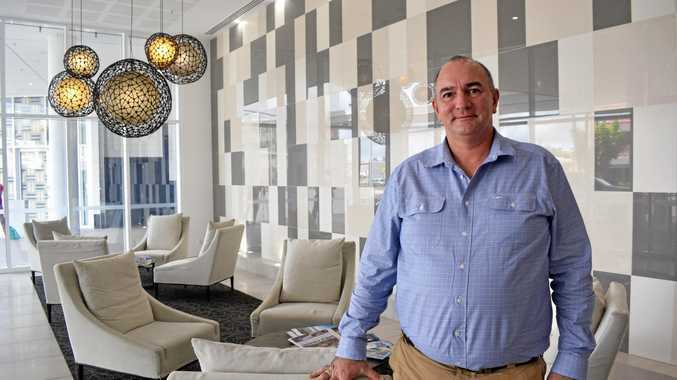 Queensland's award winning Gallery of Modern Art designers, Clare Designs as well as renowned heritage architects Conrad Gargett and local architect Brian Hooper were the brains behind the new design. Council had originally planned to re-purpose the two existing buildings at 212 and 214 Quay St, but Cr Strelow said starting afresh proved the better option in the long run. "Council considered repurposing the buildings at 212 and 214 Quay Street, however the architects showed us that this option was more expensive than building a new structure and that the space would not work for a modern gallery," she said. "Reusing the old buildings, aside from not being the best solution from a cost perspective would also restrict the collections we could showcase. "The ceiling heights would always be a challenge and retrofitting the size and style of lift required for an art gallery as well as installing loading docks at the rear eventually convinced us to start fresh. "The new design gives us the flexibility to combine two major spaces over approximately 1200 sq m, allowing us to accommodate our entire collection and triple the proportion of our collection able to be exhibited. "We could see at least 69 full-time jobs created over the two year construction period from 2018 to 2020, and further full-time positions supported and created over the following 15 years post construction as our tourism market responds." The top floor of the gallery will feature a permanent showcase of the Rex Pilbeam legacy collection, bringing the pieces which have been hidden away in storage back into view. "It will allow us to really showcase the collection, improve our programming and deliver a standout visitor experience," Cr Strelow said. "Delivery of this project will signal a new era for our arts and culture scene and our CBD." However, endorsement of the schematic designs was not without its challenges, with Cr Tony Williams speaking against elements of the recommendation to council. Although supportive of the overall development, Cr Williams proposed councillors vote to hold off construction until the project was fully funded and additional grants secured. He expressed concern about starting another project without full funding. In response, Cr Strelow said some of the funding may hinge on timing of elections and proposed instead that the construction be subject to a separate council vote at a later date. Cr Williams was not satisfied by this, recording his vote against the initial motion and Cr Strelow's additional recommendation. In thanking the councillors for their support, Cr Strelow told Cr Williams she understood the intend behind his motion. Cr Strelow said the "landmark decision" already had some strong support from other levels of government. AAA industry standard storage and back of house areas safeguarding collecting capacities for decades to come.